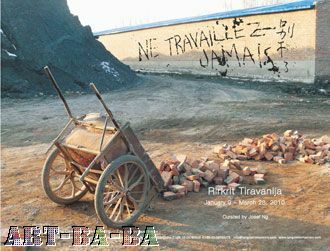 Ne travaillez jamais seeks a peripheral position beyond familiar viewpoints while promising to create individual perceptions and experiences. The exhibition title calls for a narrative with regard to the relevance of locality – in terms of both the physical and psychological construction of the place and specific site where the exhibition is situated. 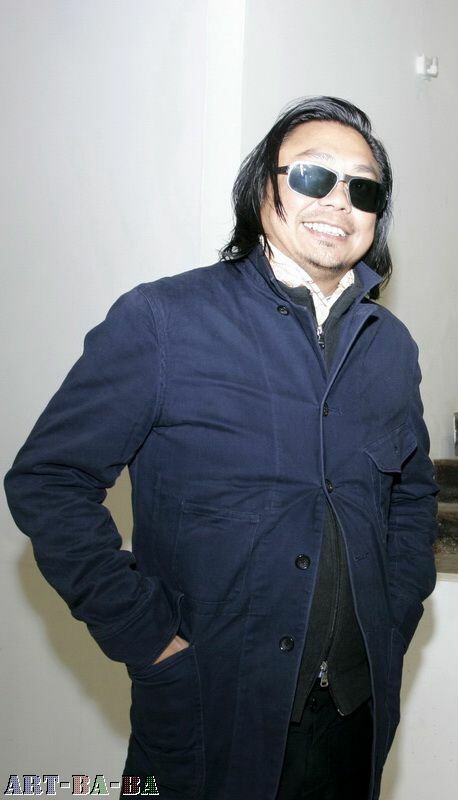 For Rirkrit Tiravanija's first solo exhibition in China, the artist employs as its title, an iconic phrase that has appeared in many of his past projects: first for untitled 2001 (no fire no ashes) in 2001, followed by a neon sign work for the Shenzhen Biennial 2003. The phrase also resurfaced in an exhibition in 2007 where it was graffitied across a constructed wall at the Ontario College of Art, where he studied in the '90s. A new home to global capitalism, China today has all eyes focused on its economic miracle, which has, subsequently become the country's proudest commercial and public relations achievement. Rapid development and speculations have flooded the population's craving for a better future. The mentality of doing work has never ceased and the currently prospering China further demonstrates the pleasures of the masses in their consumerist desires. Armed with the collective belief in hard work, the Chinese place great emphasis on material and economic conditions as indices of value and significance in their lives. Although an Asia-wide phenomenon, the world's attention is at the moment hovering around what is being produced in and out of China right now. 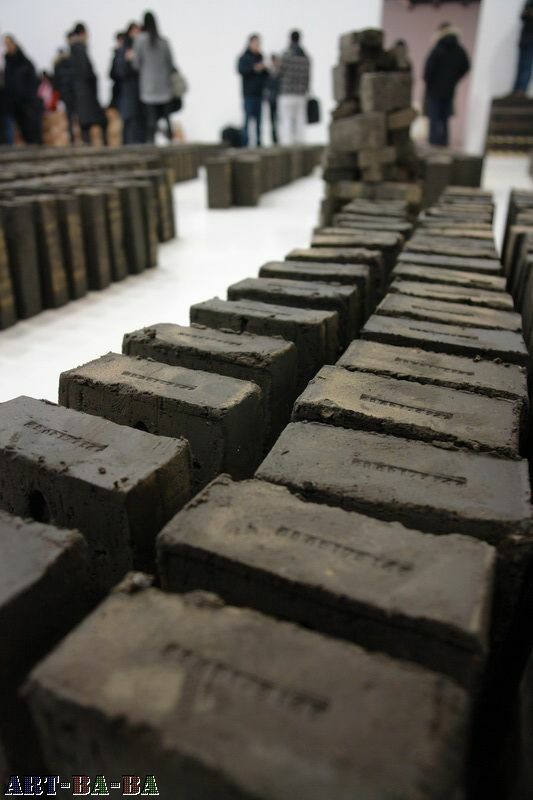 The emphasis on production in China has inspired Tiravanija to approach the exhibition as a connection that situates itself on social as well as individual relations that exist both within and beyond the gallery. 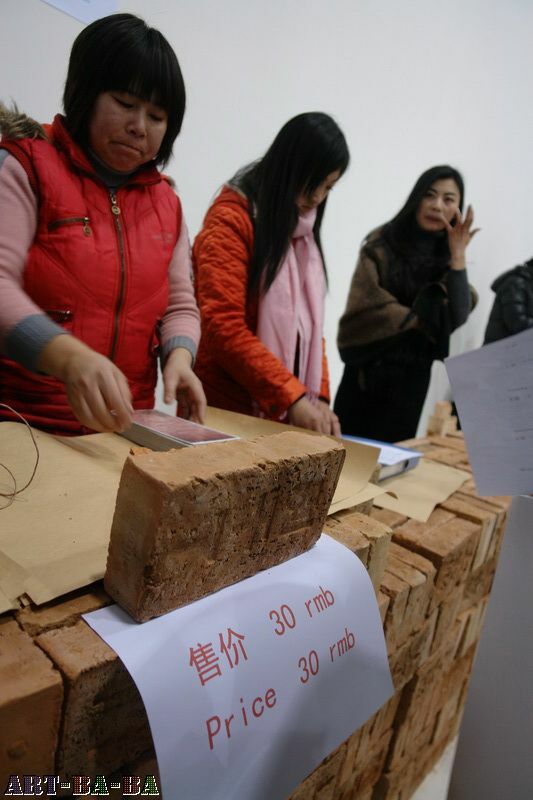 The exhibition highlights the act of building and working, which comprises the simulacra of an actual brick-making machine to be slated to produce 14086 bricks, the quantity needed to build an ordinary housing for a small family; a life-size Mercedes Benz built sculpturally as a direct copy of the gallery owner's car; a local stall providing morning dessert, known as Tofu Nao (Tofu Brain), to the public on a weekly basis; and finally, office towers constructed out of birdcages. This is not an art exhibition per se but rather a shelter where how each of the set-ups, ceaselessly transformative in the everyday, can form a responsive discourse to its visitors amidst the activities that will take place during the duration of the exhibition. 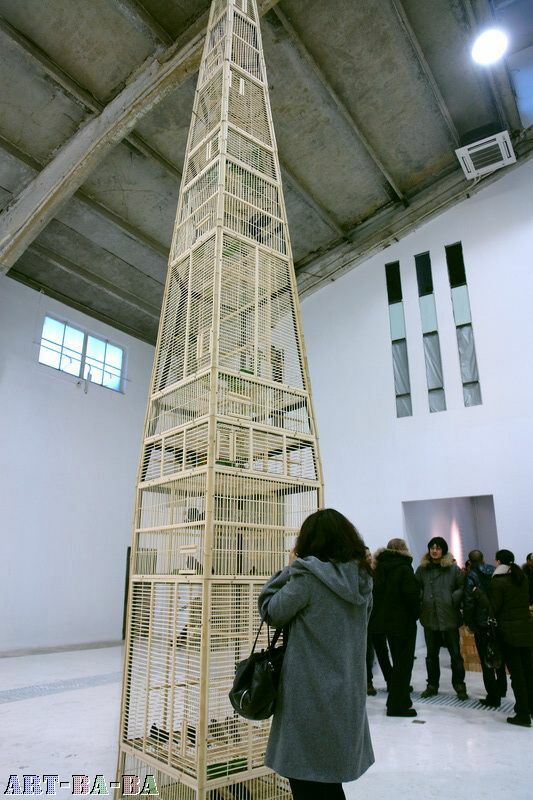 Like his past projects, Tiravanija produces strategic interplay with one's environment. For the artist, art is as much a place as an object. He insists on direct experience, on the here and now, on being there. For this exhibition, the experience stretches further into the value of meaning of life and its significance. Based on the artist’s experiences and understanding of the social-political situation of the country, the exhibition requires him to engage and suggest a re-ordering of our physical world and in this case, the physical China as he sees today. Whatever makes us reflect on the conditions of everyday life, the in-between spaces of encounters, of contexts, of moments to be reminded of our reality, Tiravanija’s regard for this exhibition is to declare a Ne travaillez jamais. Note: “Ne Travaillez Jamais”, translated widely as “Never Work”, was a graffiti slogan painted on the wall on Rue de Seine by renowned critic and theorist Guy Debord in 1953. The graffiti was also widely referenced as to relate to the 1968 springtime riots in Paris. Thai in origin, Rirkrit Tiravanija was born in Buenos Aires, Argentina in 1961. He returned to Thailand with his family when he was three and attended high school in Bangkok. He then studied at the Ontario School of Art in Toronto, the Banff Center School of Fine Arts, the School of the Art Institute of Chicago, and the Whitney Independent Studies program in New York. Always on the move, the artist currently divides his time between New York, Berlin and Chiangmai. Best known for instigating situations in projects that invite the general public to interact socially in museum or gallery environments, Tiravanija has developed significant exhibitions for the Guggenheim Museum, The Museum of Modern Art New York, Philadelphia Museum of Art, Portikus, Frankfurt; and the Secession, Vienna; Sydney Biennale, Yokohama Triennale and Venice Biennale, to name but a few from an extensive list of invitations and solo shows in Asia, Europe, and North America. Few of his prestigious honors include the Hugo Boss Prize (2004) as well as the Benesse Prize (2003), Lucelia Artist Award (2003), Central Kunst Prize (1996) and a National Endowment for the Arts Visual Artist Fellowship. And though cooking and preparing meals remains a strong forte in his expression in the last 2 decades, the artist hasn't actually been cooking much in most of his expositions for a while, a fact many outside the visual art field tend not to realize. He prefers to collaborate with different artists in simultaneous projects, and has created a variety of participatory structures in such a way that the actions of viewers comprise the artwork itself. In other words, Rirkrit’s art does not, strictly speaking, belong to him; it is not an object that anyone can possess. In his own words, the artist wants to "cut lose the phenomenon of the object, to give up materiality and to focus on the spirit of matter"
Since 2000, together with his co-founder, artist Kamin Lertchaiprasert, Tiravanija has also been active in THE LAND, an ongoing and self-sustaining project located in Chiangmai, Northern Thailand where a community of artists, farmers, students and just about any interested individuals conduct everyday activities amongst the rice paddies, vegetable fields, water buffalos and surrounding environment, the value of which is counted as much in terms of utility as anything else. Often times, as a globe-trotter, the constant traveling and adapting to different languages and customs, requires the artist to negotiate between cultures and striking up interactions etc. It is the potential cross-cultural journeys that allow the nomadic artist to create a ‘living process’ to unfold between art and life; exist in between spaces of dialogue between artist and viewer and between everyday relationships and chance. More significantly, championing a meeting point of ideas and information. A firm belief he espouses in his projects till today and beyond. These canada goose outlet lies can be used from time to time, even women - Canada Goose Chilliwack Bomber through them anyway - will only make their boyfriends sliding cheap canada goose until it becomes a habit.